Show off your sporty side with the RS Package, available on Cruze LT and Premier. This collection of urban-inspired touches was designed to pump up this compact car’s already bold style game and give you the hottest look on the block. To help you achieve your dreams of going far in life, the 2019 Cruze Diesel Sedan offers up to a whopping 31 MPG city and 48 MPG highway — that’s a maximum highway range of up to 648 miles on a single tank of gas. Or, for those who’d like to bring some extra gear along, Cruze Hatchback Diesel offers up to an impressive 45 MPG on the highway. Either way, every mile will be extra exciting thanks to 240 lb.-ft. of torque from the available 1.6L Turbo-Diesel engine. 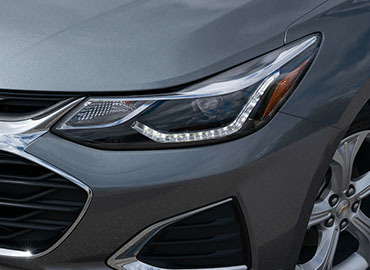 Daytime running lamps illuminate when your vehicle is running and headlamps are off. Going on a camping trip? Working on a new project? Cruze Hatch offers 47.2 cu. ft. of cargo space when the second row is folded down. So not to worry — there’s plenty of room in this hatchback for whatever fuels your passion. Staying connected is one of your top priorities. That’s why this compact car comes standard with the Chevrolet Infotainment System, smartphone integration and more — so your music, select apps and other data are along for the ride. When in Reverse, this feature provides the driver a view of the scene directly behind the vehicle on the color touch-screen display to help them park and avoid nearby objects during low-speed maneuvering. This feature provides side-mirror alerts to help the driver avoid crashing into a moving vehicle detected in their side blind zone or a vehicle that is rapidly approaching their side blind zone during a lane-change maneuver.